For six months, a healthy, 39-year-old man began having spells of vertigo. Then one night, he had a very severe episode and was brought to Duke Regional Hospital. He was diagnosed with a small stroke in his cerebellum. The next morning, he began to experience severe “salt-and-pepper” eye pain and became extremely distraught. 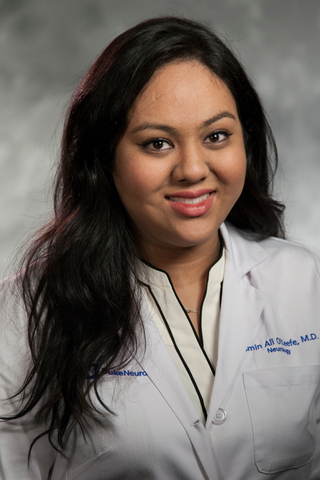 Suspecting that he was having a second, more serious stroke, Duke neurologist Yasmin O’Keefe, MD, had him brought to the catheterization laboratory and requested CT angiography. Question: What signs was O’Keefe recognizing, and what was the patient’s diagnosis? Answer: The sudden onset of the patient’s severe eye pain following a posterior circulation stroke indicated that the patient had a clot in his basilar artery. During the time the patient was undergoing imaging, he started to decompensate: His movements became spastic and stiff, he began slurring his speech, and he started to develop hiccups and hemiplegia—all signs that he was undergoing a devastating stroke, O’Keefe says. Because the patient had just had a stroke the evening before, he wasn’t indicated for IV tissue plasminogen activator. His only option was mechanical thrombectomy, and, with the help of Duke transfer center nurses and neurologists, he was quickly transferred to Duke University Hospital to undergo the procedure. Within an hour of the patient’s CTA, neurosurgeon Erik Hauck, MD, had successfully removed the clog and achieved full reconstitution of the patient’s blood flow. There were no complications, and days later, he went home to his wife and child, having returned to his baseline neurologic and physiologic function.